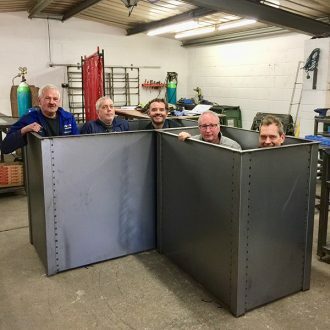 Our highly skilled craftsmen were temporarily stuck in these very large, bespoke steel planters commissioned in December. You can see two, from a set of four, bespoke troughs designed to sit on a newly designed south facing terrace. As they’re pre-zinc galvanized, the welds can be seen up each corner, soon to disappear once they’ve been hot dip zinc galvanized for a rust resistant, very tough finish. We’re delighted that our planters are being used extensively for the new Ivy Brasseries opening the length and breadth of the country. See them for yourself at Tower Bridge, Soho and Edinburgh to name a few. Some of the planters are used to screen the diners on outside terraces and pavements, the perfect café planter. Whatever your planter requirement, get in touch as we can design and manufacture any size, as well as incorporating trellis screens for added privacy.